When people hear that the newest horror flick coming to theaters is about possession, people count down the days until they get to see it, theaters are packed, and popcorn starts to fly as people jump and watch little girls become possessed. 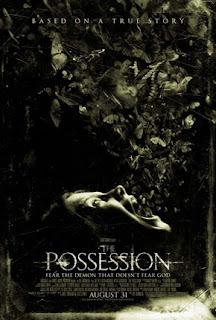 The newest possession movie, The Possession is based on a true story, or so they say but I would put money on it that the entire hour and a half was completely exaggerated. Every horror film these days is “based on a true story.” How many psycho ghosts and demons could possibly be out there? It resembles almost every cliché possession movie ever released by following a young girl who starts acting oddly, becomes belligerent, curses in every sentence, then her family figures out she’s possessed, and find someone to perform an exorcism. So while it possesses, pun intended, cliché horror story lines, it does have unique plot points and does provide scary scenes. It follows divorced couple Clyde (Jeffrey Dean Morgan) and Stephanie Brenek (Kyra Sedgwick) and their two daughters. At a yard sale, the youngest daughter Em (Natasha Calis) has her eye set on a wooden box with ancient carvings on it. Dad buys it for her and she and the box become inseparable. As time goes on, the parents notice their daughter acting oddly, becoming erratic, and finally discover that the box was built to contain a dibbuk, an evil ancient Jewish possessing spirit that devours its human host. The family decides to find and bring in a Jewish man named Tzadok (Matisyahu) to help save the young girl. The daughter who becomes possessed, Em, was fantastic. Actress Natasha Calis did a phenomenal job at being creepy as hell. Thank goodness her performance was great because if not, the film would have fallen apart. The new take on the Jewish religion was a nice change. There were also a lot of creepy scenes. I won’t give any away but some had me cringing, jumping, and frozen in fear until it ended. There are also some unintentional humor and some intentional. Some scenes lighten the mood while others, which were meant to be scary, but when an invisible spirit is throwing around people against walls, it just looks silly. The special effects were pretty good and the music added to the film’s creepiness. I wish the exorcism scene lasted a little longer than it did. There was plenty of creepy stuff before but during the actual exorcism is when the possessed, in any movie, become even more terrifying. But all in all, it gets my stamp of approval. The Exorcist, the original, has definitely influenced many films in Hollywood, and certainly has influenced The Possession, but since the director, Ole Bornedal and producer Sam Raimi, added new flavors to the mix, it made this demon possessing film one of the better ones.